Gift of Mrs. Willis Koehler to Deane Seeger. Gift of Deane Seeger to Friends of the Library,1968. Description Sepia photo. Same as 151a - g, 1400, 1657, 2483, 2971, & 5672 although they may be cropped differently. 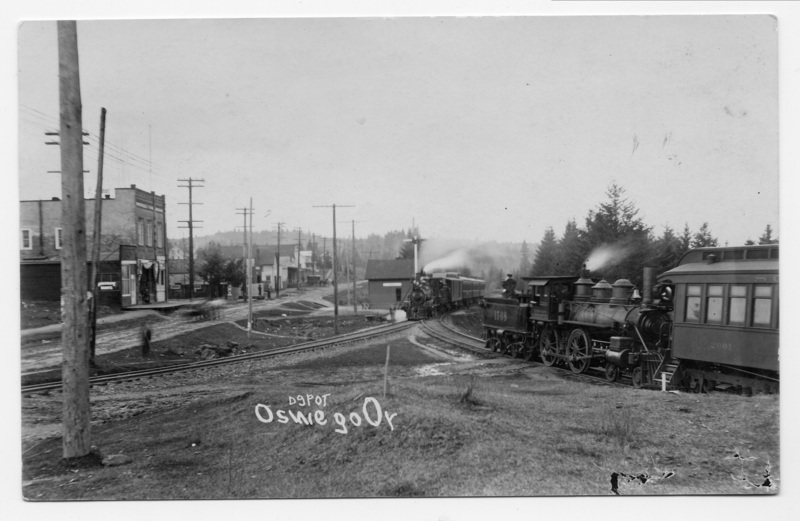 Imprinted on front: depot Oswego Or. Numbers on engine and car: 1508, 2001. Lettering on car: Southe[rn]. Negative filed with photo. Transcription Gift of Mrs. Willis Koehler to Deane Seeger. Gift of Deane Seeger to Friends of the Library,1968. Physical Description H 3.5" X L 5.5"